Jeremy Wade is one of the people we can call multi-talented. He is a television presenter, an Angler, as well as an acclaimed author of books on Angling. Famous for his appearance in the television series, River Monsters and Jungle Hooks, he has also worked as a tour leader, teacher, art tutor, translator, public relations consultant, dishwasher, as well as a newspaper reporter. Also known as “River Monster Hunter” for his work as an explorer of rivers with river monsters like pythons, crocodiles, and sharks, in the Congo and Amazon forest – on the TV series River Monster – as well as run the Jungle Hooks, aired on Animal Planet. His show, River Monster, has achieved the highest audience figure in the history of Animal Planet. Jeremy Wade was born to a Vicar father in Ipswich in Suffolk, on 23 March 1956. He has one brother – Martin Wade. Jeremy Wade attended high school at Dean Close School, from which he attended – and graduated – from Bristol University with a degree in Zoology. He went on to the University of Kent, from which he secured a postgraduate teaching certificate in biological sciences. His first job was as a secondary school biology teacher in Kent, before he went on to build a flourishing career on TV. Though he has traveled the world on account of his job and interest in fishing, not all of his journeys around the world had been because of fishing, as he has been detained as a suspected spy several times in his life. He has also caught malaria, from which he very nearly died, as well as being threatened at gunpoint. Wade has even survived a plane crash. Fluent in several languages, including Portuguese, French, and Spanish, Wade began fishing at a very early age. He grew up in East Anglia, on the banks of Suffolk’s River Stour. This hobby would go on to become his lifelong passion. Soon, Jeremy Wade started traveling the world, searching for different species of fishes and water creatures available throughout the world. He made this his lifelong obsession, making his first oversea trip in 1982 when he went to the mountain river in India. He would always remember that trip as a struggle for him at the time. When he got back home to England, Jeremy Wade journaled about his experiences in India and the things he learned from the different species he had encountered in the rivers down there and sent the articles to a fishing magazine. The write-up was accepted almost immediately, and this led him to consider his next oversea travel. He had found his life’s work. Wade’s job has taken him on many trips to the Congo and the Amazon rain forests in search of the world’s rarest species of sea creatures. In 1992 he published his first book, Somewhere Down the Crazy River. He has also written River Monster, a book about his journeys around the world. It was on a subsequent trip to India in 2005, according to Wade, the idea for River Monster show first came to him. 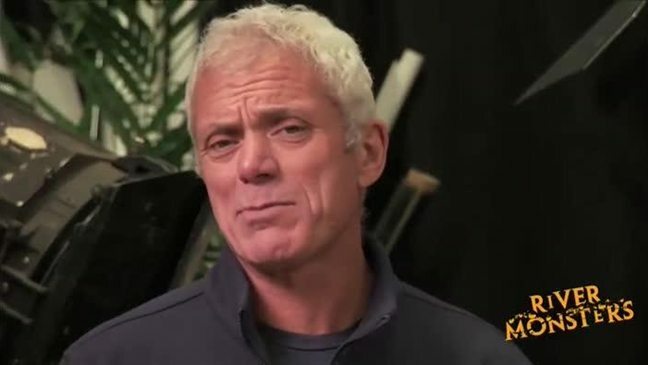 Jeremy Wade covered the Lampreys in the River Monster episode of Vampires of the Deep, and in 2014, he made his acting debut, appearing in Blood Lake: Attack of the Killer Lampreys, a movie in which he acted the role of Lamprey expert. In the year 2014, Wade made his acting debut appearing the movie Blood Lake: Attack of the Killer Lampreys in the role of Lamprey expert. Before, this, he had covered the Lampreys in the River Monsters episode of Vampires of the Deep. The movie has made the episode as its reference where Jeremy has allowed himself to be bitten by the Lampreys to test on their abilities. Information regarding the personal life of Jeremy Wade is scanty, and whatever information is available is under review, as he has been very discreet and secretive concerning his personal life. However, his personal website suggests he is still unmarried. There have been several rumors surrounding a secret marriage he was purported to have had. However, the rumors haven’t withstood the test of time. This has even led to rumors of him being gay, although his silence about all of these makes it impossible for anyone to say with absolute certainty about his sexual orientation and relationship status. Tweeting regularly as @RiverMonstersUK, Jeremy Wade posts pictures and updates about his life and work to his 33 thousand followers on Twitter. On Instagram, though, he posts as @thisisjeremywade to his 62 thousand followers, where he also shares pictures of his travels and work. Wade is a strong and fearless person. The workaholic presenter has earned so much from his work, with his current net worth estimated to be USD $1.5 million.